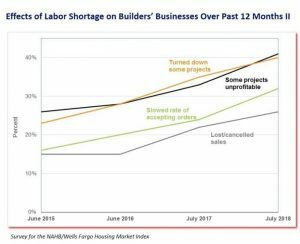 According to the National Association of Homebuilders, a record share of single-family builders reported shortages of labor and subcontractors in July. In a survey they conducted, builders were asked about the effects the shortages were having on their businesses. Builders noted having to pay higher wages and an increase in subcontractor bids as the most common problem. This increase, in turn, had a two-pronged effect forcing them to increase home prices and making it difficult to complete projects on time. Since 2015 these have consistently ranked as the most commonly reported effects of the labor and subcontractor shortages as reported by builders. 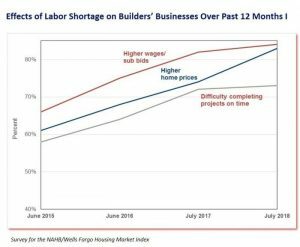 Since 2015 there has been a 22% increase in the percentage of builders that say labor/sub shortages are causing higher home prices. The figures for higher wages/sub bids and increased home prices are almost tied as the most widespread effect of the scarcity. The survey also questioned how much labor and subcontractor costs for building the same house have increased over the previous 12 months. 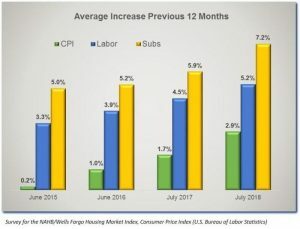 The accompanying chart shows the average responses and compares them to overall inflation, using the Consumer Price Index as a measure over the same 12-month period. Three things are evident in the chart. The cost of subcontractors has risen even faster than the cost of labor directly employed by builders. This year, for example, overall inflation was just under 3%, labor costs increased by 5.2%, and subcontractor costs by 7.2%. On average three-fourths of construction costs typically represent work performed by subcontractors, so these increases are particularly significant. The effects of labor and subcontractor shortages widespread in the building industry are on the rise. Builders are indicating that the shortages have slowed the rate they accept incoming orders. Builders are also reporting that lost or canceled sales are up 26%.